Profit Pal now includes a no materials box you can use to bypass adding materials if not desired! Check and use when invoicing jobs that don’t require materials. By checking that box you can continue within the job and invoice save it and send it to the client. 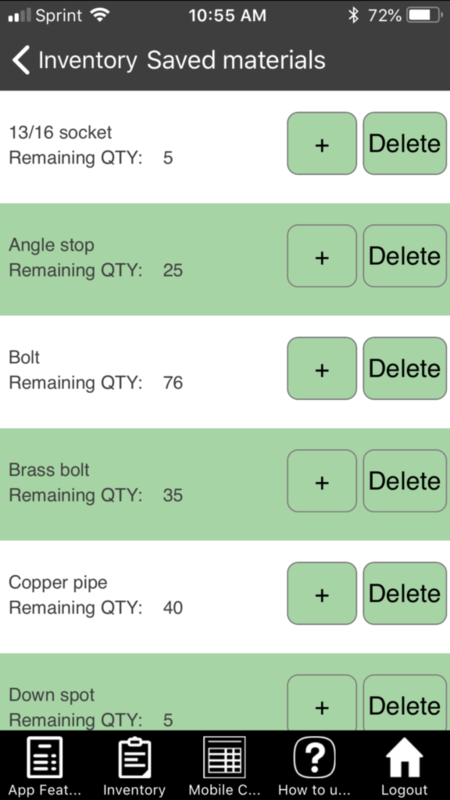 To invoice materials you’ll start by tapping the Company Inventory button on the App Features Screen (main screen). When adding materials to the app you need to first create your materials inventory! You’ll do this by selecting “Company Inventory” Button and then select the “New material” button. There you’ll enter the Part Name, Price per unit, Size, and Start QTY. Once added tap the Calculate button at the top of the screen. Each time you add a part you must hit the Calculate button to submit it to the app. Once you have created the list by adding each part and tapping the large “Save” button you’ll see it say “submission” and save that part of the list. You can now use the Add Materials feature on the jobs creation screen by tapping “Edit to upload materials” it will go to the Materials List and let you select the material and quantities to add to the job. Now when you are creating your job file for the particular job where it says Current Job Total: just below that in Red it says Tap Edit to upload materials, you tap there. Then tap the big green button that says “Upload materials” it will open up your materials list tap “Select material” you’ll see all of the materials you have added to the list. You’ll select the item you are adding to the job the quantity, and tap the calculate button at the top, and the app will add it to the job. Hit the + and continue to add parts from your list each time you add a new part to the invoice just hit the calculate button at the top and that item is added to the job file and later to the invoice. That’s all there is to it! Just practice it a few times and you’ll get it!